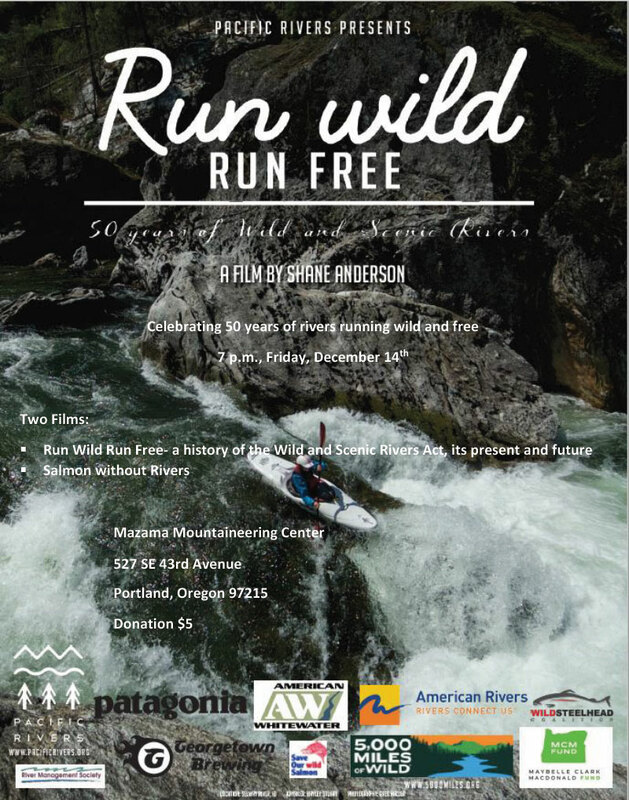 Celebrate the 50th Anniversary of the Wild and Scenic Rivers Act and the 30th Anniversary of the Omnibus Oregon Wild and Scenic Rivers Act with two films by Pacific Rivers and director Shane Anderson: Run Wild Run Free and Salmon without Rivers. The first is a history of the origins of the 1968 Act and the passionate and courageous people who demanded protection for free-flowing and wild rivers. The film also highlights the current campaigns for rivers, many in the Northwest, which still need protection. The second film features Washington’s Skokomish River which has been so altered by the exploitation of natural resources that wild salmon have to cross roads to find home. Greg Heller, Executive Director of Pacific Rivers, will be there to discuss the films and answer questions. Admission is $5 (cash only) at the door with all proceeds donated to Pacific Rivers. Sponsored by the Mazama Conservation Committee.